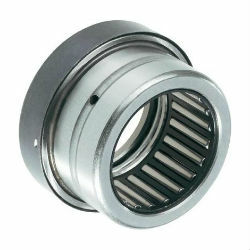 These series comprise radial needle roller bearings and a rolling bearing component capable of supporting axial loads. They can support high radial forces as well as axial forces in one direction. NKX are lubricated with oil. The end cap in NX has lubrication holes. NKX..-Z are lubricated with grease. The axial bearing component is greased using a lithium complex soap grease to GA08. The end caps do not have lubrication holes.